Visit the Kyushu pottery villages and purchase some of the highest quality yet best value ceramics in Japan. It’s a fascinating day out and you can grab some excellent souvenirs (instead of the usual tat) at bargain prices. Read on for info, videos and ideas for fun things to do. 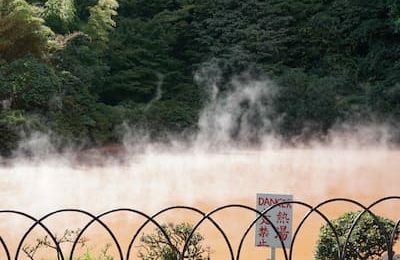 Take a day trip from Fukuoka or take your time and stay a night or two in the area. The three most popular villages on the tourist trail are Arita, Imari and Karatsu but there are many others too (we’ll offer our recommendations later). These three villages are located in Saga prefecture just a few hours from the main city of Fukuoka. It’s a great opportunity whether you are a ceramic expert or just looking for a pot, mug or a plate to take back home. In fact, you don’t even need to spend a penny. You can have a great day out just exploring the workshops and the ceramic museums to see what it’s all about. It’s incredibly photogenic and you can get up close with some of the best potters around. You will also see some of the most exquisite designs available anywhere. If you do choose to buy some ceramic items while you are there you can be assured of the best value with clear and upfront pricing. No need to worry that what you are buying won’t be the genuine item. Pottery has been produced in these Kyushu villages for hundreds of years. The art has been passed down from father to son, and in some cases to daughters too, for generation after generation. We visited a kiln recently in Karatsu and met a 14th generation potter (video here). They understand and accept that this will be their lifetime duty. This results in a rare pride in their work. It’s not just a job. Interestingly, in times gone by potters were forbidden to leave by their feudal lords because their skills were so highly prized. Luckily these days it’s a vocation. 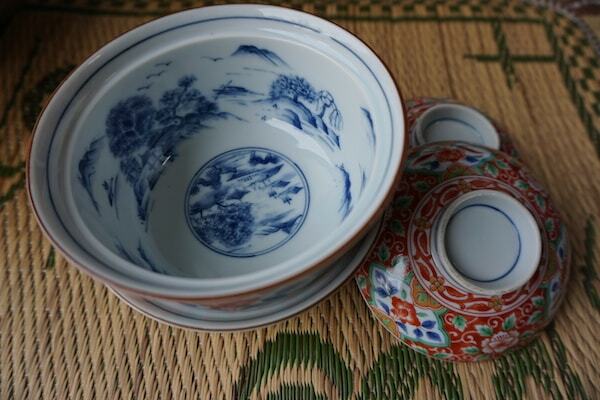 The first Japanese porcelain was made in the Arita region of Kyushu in the early 1600’s. It has been produced continuously in Arita since then. You can still visit today those original kilns. This continuation of pottery production gives us some of the finest ceramics to be found anywhere on this planet. If you are in Kyushu don’t miss this chance to explore this deep and meaningful craft. Take a stroll around the studios and kilns of the area and you will soon begin to get a feel for the different styles available. Just make sure you don’t get overwhelmed. Arita alone has more than 20 galleries in addition to the excellent Kyushu Ceramic Museum. You won’t fit everything in so just aim to enjoy your day and hopefully go home with a souvenir that will last a lifetime. These are souvenirs to pass through your family for generations to come. In my house here in Kyushu we still use pottery produced 100 years ago. Traditionally blue and white. Soon became famous for coloured overglaze with red especially favoured. More recently pure white porcelain has become popular. The white porcelain emphasises shape and simplicity instead of decoration. Brown and earthy colours giving a simple, natural feel. Parts of the pottery (especially the base) are often left rough and unglazed. Karatsu pottery is generally fired in wood-fired kilns. This results in each piece having it’s own unique character formed by the licking flames. Commonly used in Japanese tea ceremony. 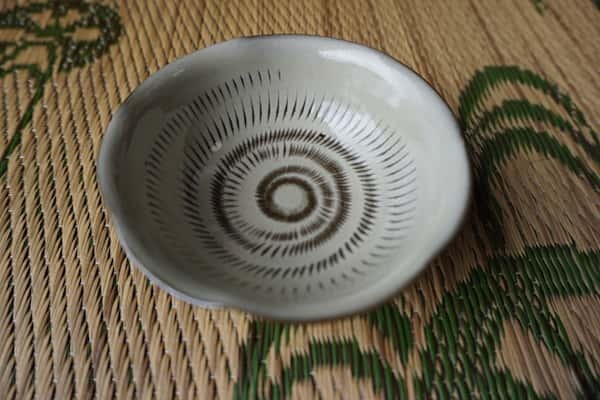 Actually Amari ware (sometimes known as Hizen ware) is a kind of Arita pottery. It is often more heavily decorated (“fussy”) than classical Arita pottery with lots of blues, reds and gold. You may have seen it in museum in your home country as it was heavily exported from the 1700’s. It’s earthenware rather than porcelain. Nothing fancy, a daily-use pottery of cups, mugs, plates and bowls. Commonly brown and grey with distinctive pattern (see photo below). The photos below show our daily use pottery (nothing fancy or expensive). Our house has been continuously occupied by Moo‘s family for nearly 100 years so this stuff has been bought by different family members over the years. Although these villages have been producing ceramics for hundreds of years you shouldn’t get the idea that they are stuck in the past. Many of the modern potters pride themselves on producing the most modern and innovative designs. The arts may be passed down from father to son but the imagination belongs to the potters themselves. Take a look at the one-minute video below to see the stunning cutting-edge designs of Kyushu pottery. I took all these photos in Kyushu Ceramic Museum. Don’t miss the chance to visit Kyushu Ceramic Museum. It’s located in Arita and is free of charge. It’s modern, well-lit and displays so many gorgeous pottery designs. You can see Kyushu area pottery ranging from ancient to modern contemporary. The oldest I found there was more than a thousand years old! Designs hundreds of years old wouldn’t look out of place today in my local department store. It shows clearly that art and style are timeless. It also helps us understand that classic ceramic designs are recycled over the centuries. Kyushu Ceramic Museum isn’t huge so you can easily see all the designs in a hour or two. You certainly don’t need to be an expert to visit (I’m not!). The beauty of the pottery on display is enough. I was transfixed by the art and the feeling of history that continues to this day. Don’t skip the cafe! 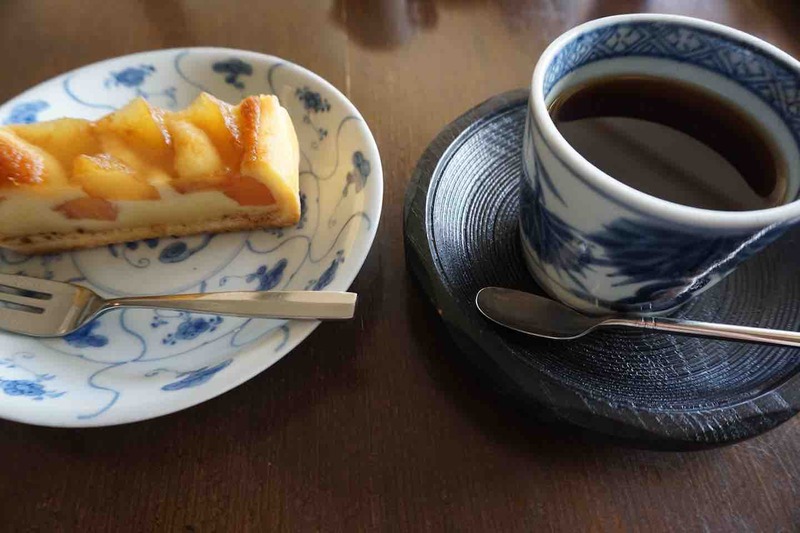 I was amazed to have my coffee and yummy apple tart served on 200-year-old genuine Kyushu pottery (see below). You can download an English pamphlet here. Ask us to include a visit to the Kyushu Ceramic Museum in your itinerary and see it for yourself. The video I made (above) shows just a small selection of the itmes on display. The annual pottery fair is held in Arita every year during the Japanese Golden Week (from the end of April into the first week of May). It’s a great place to pick up a bargain but get there early and expect enormous crowds to get there early too. The fair has been running for more than 100 years and attracts more than 1 million visitors! You may find yourself overwhelmed by the incredible number and variety of ceramics for sale. Over 500 shops and stalls will be selling their wares. You may even feel intimidated and slightly unsure because of your lack of knowledge. Yes, it’s true, many ceramic buffs do visit the area and for sure they know their stuff. However we can probably say that most people are happy amateurs like you and me and may never have bought a single piece of genuine pottery in our life. Don’t worry about it and certainly don’t let it put you off buying what may be your most delicious purchase in Japan. The crowds at Arita Pottery Fair are so huge you may prefer to visit the pottery fairs held at other villages instead. Many villages have copied the Arita idea of holding pottery fairs once or twice a year. They will all be held in Golden Week and perhaps in Autumn too. The Arita fair is so well known the crowds can become overwhelming. If you want to plan your Kyushu vacation around these fairs get in touch and we’ll let you know the exact dates. When exhaustion overtakes you, head to Gallery Arita (it’s our favourite). Not just a gallery but an ’emotional space of food and pottery’. The ceramics are heavenly though certainly not the cheapest. Honestly speaking, we’ve never bought anything from there but we love to look. The big attraction for us is the cafe there. For your meal service you can choose from the wonderful collection of porcelain on offer. Take your time and walk around as much as you want. The showroom owners will never give you hard sell and absolutely don’t expect you to buy. Don’t feel rushed. If you see something you like, gently pick it up (remember breaking is buying!) and see how it feels. For half of the joy of ceramics is in the feel as well as in the look. Don’t be ashamed to choose something in your own price range. Imagine how it might look in your dining room or on your kitchen table. Your taste belongs to you so have the confidence to choose whatever works for you. Don’t forget to have a look at as many different workshops as you can before you buy. Even though each village has its own style, you’ll find lots of variation as you move from kiln to kiln. If you are in Arita head to Arita Será. It’s a one-stop-shop for pottery buying. There are lots of pottery outlets here in one big shopping mall. If you don’t have time to wander Arita town it’s the next best thing. In fact, if we shop for porcelain we often head here after browsing the studios and kilns. You’ll get some great bargains! Grab a basket! One of the workshops in Arita is more than 150 years old (of course there any many much older). In that time they have gathered mountains of unsold ceramics. It lies unsorted gathering dust in a huge warehouse – see photo. Just like Aladdin’s Cave! They came up with a novel idea to clear their stuff out. You can pay ¥5000 ( about $50) and fill a basket with whatever you find. You get 90 minutes to poke around and it’s so much fun. If it’s too heavy to carry home they will happily arrange shipping too. Ask us if you want to include this fun shopping trip when we plan your itinerary. If you want a wider range of activities head to Karatsu. Pottery is still the main focus but you will have other things to do too. Head to 400 year-old Karatsu Castle. It’s very grand and pleasantly sits facing the ocean. It’s especially photogenic during the cherry blossom season. You can also visit Karatsu Shrine founded over 1,000 years ago. The nearby exhibition hall displays the impressive floats used in the city’s most famous festival. Nature lovers can enjoy one of Japan’s top three pine forests (with 1 million trees) and a long beach. 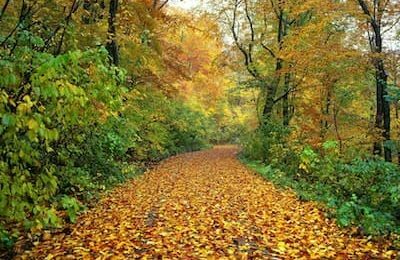 It’s a great place for cycling or strolling. You can stoll up the nearby observatory for pleasant views. If you prefer a challenge you can tackle an 11KM circular hike. Of course, Karatsu is still about ceramics. 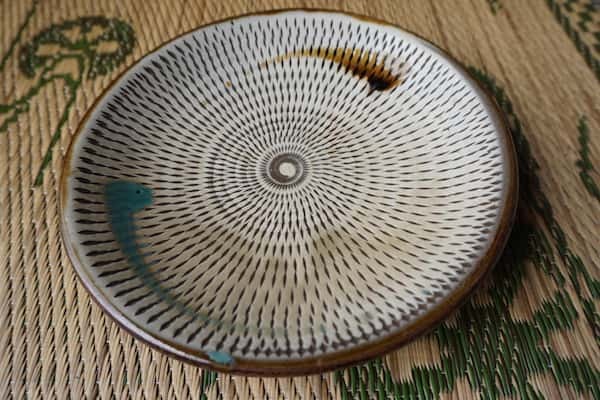 Karatsu ware (also called ‘Karatsu-yaki’) has been produced continuously for 100’s of years. You can visit many active kilns and see other long-abandoned ones. 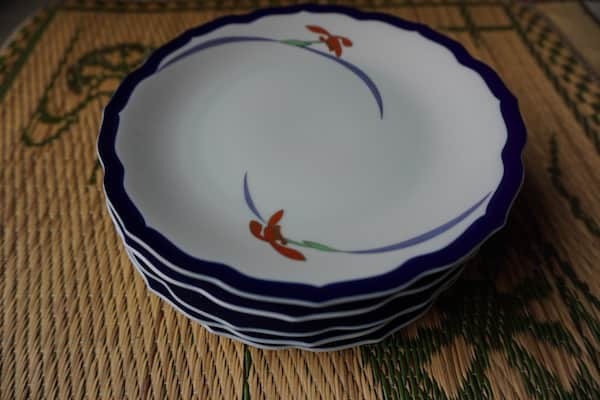 Katasu ware is popular for use in the Japanese tea ceremony. The colours are often earthy browns adorned with flowers, plants, birds or mythological creatures. Don’t worry, it’s not just tea ceremony ceramics for sale. You’ll find many shops selling ceramics for basic daily use too. See the beautiful potteries and ceramics at Karatsu Ichibankan shop and gallery: of course there are many other pottery shops in town but this is a one of the most popular Karatsu galleries.. They have beautiful displays and also an online shop. You can also visit Nakazato Tarouemon ceramics gallery and shop. The family had been a purveyor to the Karatsu feudal lords for generations. If it’s good enough for them, it’s good enough for us. Want to know more about Arita and Karatsu? Take a look at our Arita and Karatsu road trip report. You’ll learn more about the different types of pottery and what else you can see and do if you visit. In addition to the three famous villages of Arita, Imari and Karatsu you can find many other smaller but no less interesting places to explore. Koishiwara is one of our favourites. You will find a different kind of pottery there, more rustic, with a strong earthy feel, slightly primitive perhaps, yet with the warmth of clay. It’s perhaps most well-known to those who pass through (rather than stop and spend some time there) for the enormous dishes and pots on display along the roadside. Don’t be fooled however, this is mostly a gimmick. 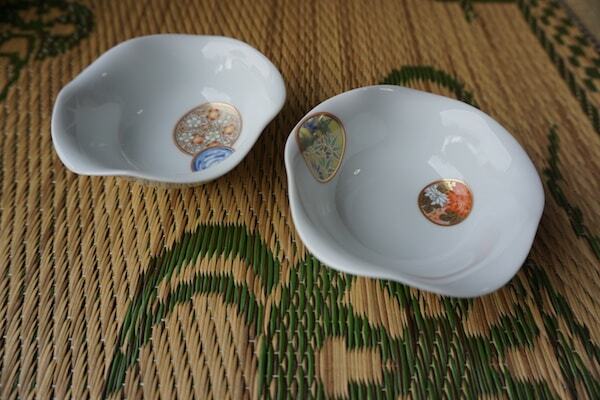 Koishiwara-ware in reality is pottery that it is designed for daily use. The relative thickness of the pottery, especially compared to the more delicate lines available in Arita, makes it a great choice if you live in a colder climate and like to keep your coffee toasty warm. It’s a great place to pick up some coffee cups, plates or bowls that you will be happy to serve your family with. Koishiwara is a small village and like most of the villages in this area has been producing pottery for generations. 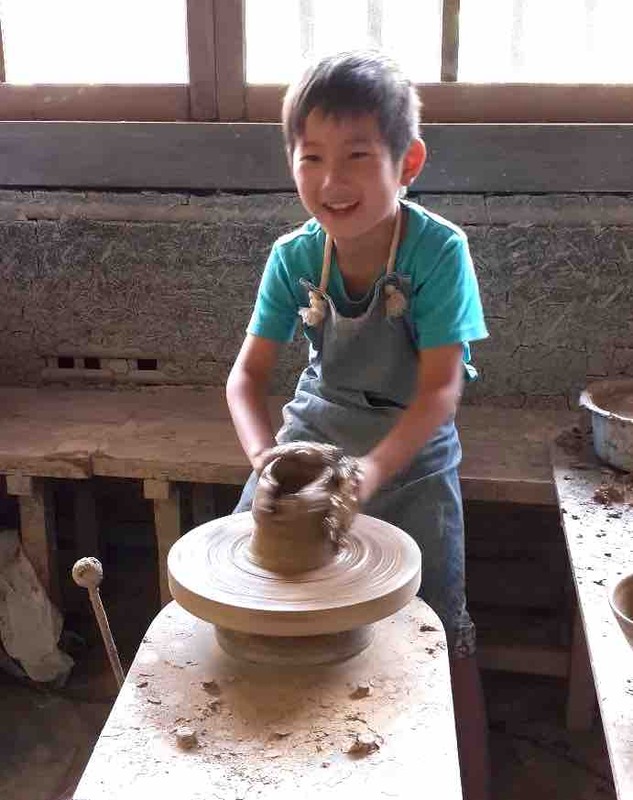 In fact, you will find that almost every family in the village is involved in some form of pottery production. The area was flooded in the summer of 2017 and the local government is kindly requesting (in that polite Japanese manner that we love so much) that people choose to spend their money in this area to support the rebuilding of the local economy. We are happy to oblige. Koishiwara is typical of most of the Kyushu pottery villages in that it’s not so convenient to travel there. 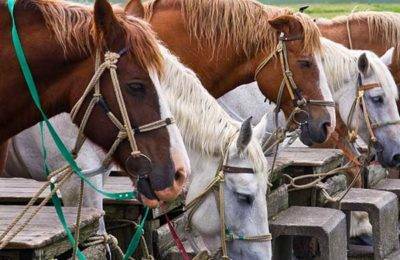 Most of them are a two-hour drive from Fukuoka, the capital city of Kyushu. You can reach them by public transport too but it often is not convenient, especially in winter.If you don’t know how to get there contact us and we’ll be happy to help. The point is, these villages didn’t develop as a tourist attraction. Rather, ceramic production developed in this area because of the excellent quality of the local clay. In those days of course the target market was the local feudal lords. Some of these villages are tiny, perhaps just having a single convenience store and one set of traffic lights. Don’t be put off though. A visit to these villages is an unmissable part of your Kyushu trip. It’s not often you can find genuine quality ceramics like this. You can’t go to a pottery fair and come back empty-handed! We went to the Koishiwara Autumn Pottery Fair (2018) and got the plates in the above photo for FREE with our ¥600 onigiri (rice balls). 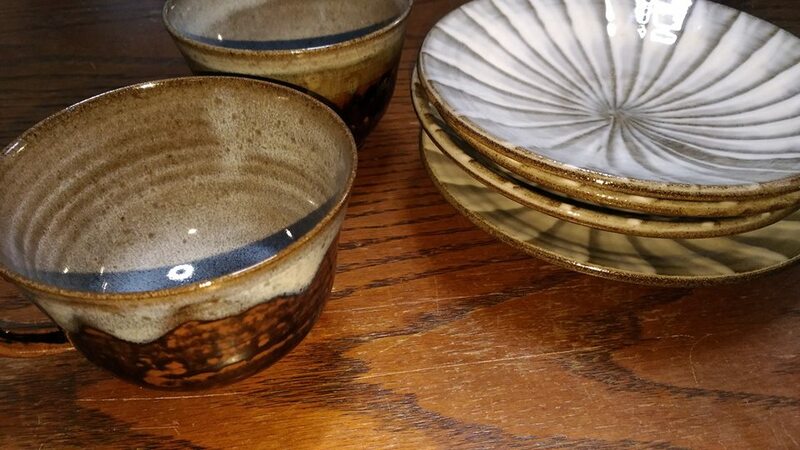 The cups cost ¥1,000 each but are hand-made Takatori yaki (Takatori pottery) from a wood-fired kiln. Takatori yaki is much lighter and more delicate than Koishiwara yaki and based on colours found in the natural world. Takatori kilns started production in the early 1600’s and Takatori ware is actually an older form of pottery than Koishiwara ware. Geographically it’s found in the same area. 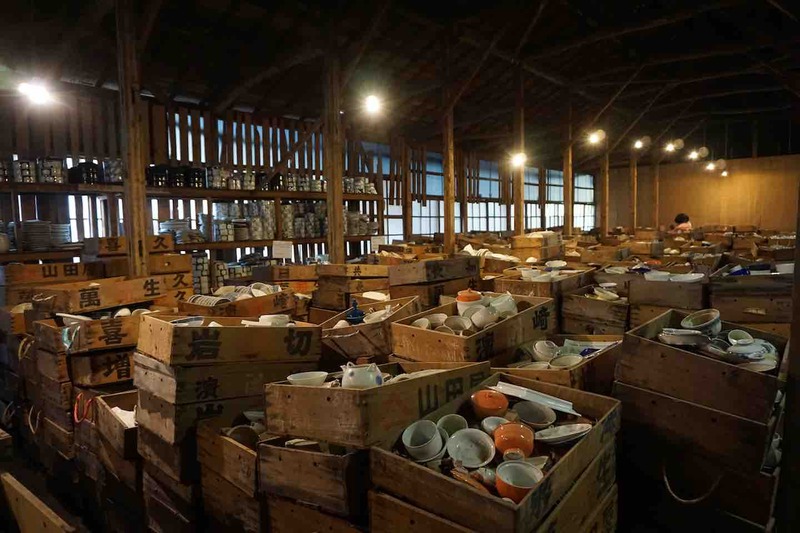 Most kilns in ‘Koishiwara’ produce Koishiwara pottery but some still produce Takatori pottery. Just to confuse things a bit more the village of Koishiwara technically no longer exists. Due to some inane bureaucratic reorganisation this proud and ancient village was amalgamated into a newly created entity called Toho about 20 years ago. However when you go there, you’ll still see roads signs for ‘Koishiwara’. Hasami produces classic blue and white pottery. It’s one of the original pottery villages with a 400-year history. 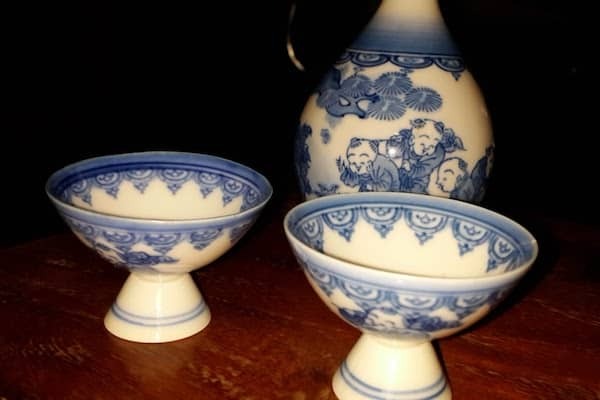 In the late Edo period is was the biggest blue and white producer. When the more glamorous villages were exporting their gorgeous pottery to Europe, Hasami ware was sent overseas as simple containers for export sake. You will often come across these original bottles in antique shops in Europe. Unlike the more famous pottery villages the ceramics made here are for daily use (not for tea ceremony formal use or as ostentatious gifts to be presented to higher-ranked persons). These days Hasami ceramics has developed a more simple style. It can be compared to North European modern pottery and is favoured by younger Japanese for daily household use. Look out for Hakusantoki (白山陶器 マルヒロ). This is currently one of the most popular producers. Try your hand at pot making or pot painting. Let your artistic side flourish! It’s a lot of fun for kids and adults alike. Contact us for details. The pottery villages of Kyushu are unique. Don’t be afraid to take a look. Amateurs like us are always welcome. You’ll find something you love, whatever your taste and budget. Don’t miss the chance while you are in Kyushu of a visit. As you wander around feel the history merging into the present day. We hope this page gives you a good introduction to the Kyushu pottery villages and the exquisite ceramics you can find. Send us a message if you need help to plan your holiday. We’ll include a trip to these villages in your Kyushu itinerary and much, much more. Leave a comment below if you have anything interesting to share about the Kyushu pottery villages. Ask us a question if there’s something you want to know. Correct us if you found a mistake. Say ‘hi’ if you love pottery. So where is the pottery warehouse and for the shipping, is that extra? Hi Amanda, it’s at Kouraku Kiln in Arita. Google map link here: https://is.gd/S7uf3p And yes, the shipping fee is extra I’m afraid. Hello. Will be in Fukuoka early April 2019 and looking to attend a simple pottery class in Karatsu. Do I have to book in advance or can I just walk into a kiln and tell them I want to attend a class? Thank you. You’ll need to make your booking in advance. Of course not all kilns offer this (most don’t) so you’ll need to do some research first. Would like to visit the pottery and nature attraction but with public transport only on either 31 Dec or 1 Jan. May I know whether the area is open and how am I going to reach there? Will be staying in Hakata and need your advise which town would you recommend to visit. If travelling by public transport the most convenient pottery village to visit is Karatsu. From Hakata it is easily accessible by direct train (no need to change trains). It takes about 1 hour and 20 mins. After you arrive in Karatsu you can visit the tourist information centre which is inside the railway station. The tourist information centre is open on Dec 31 (09:00 – 18:00) but closed on Jan 01. Unfortunately most galleries and kilns will be closed Dec 31 and Jan 01. For this reason it’s best to visit on a different day. Hope this helps. Let me know if you need any more information.